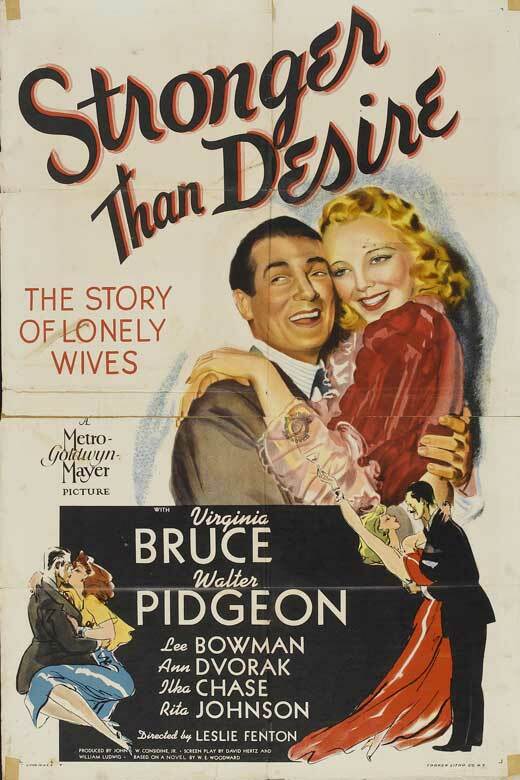 Elizabeth Flagg (Virginia Bruce) is a wife and mother, wed to Tyler Flagg (Walter Pidgeon), a defense attorney with a record of success and a reputation of brilliance. Tyler’s reputation for greatness is made possible by his dedication to his job, but as his career has flourished, his marriage has suffered. Elizabeth thinks they’d be happier if they were a little less rich, and spent a little more time with each other. Upset that Tyler is unwilling to cut back on his work hours, Elizabeth soon becomes convinced that he has struck up an affair with one of his clients, flirty socialite Barbara Winter (Rita Johnson). Tired of being neglected by her husband, she falls under the spell of the charming Michael McLain (Lee Bowman)… but her decision to strike up a friendship with him has grave consequences. Leslie Fenton directs 1939’s Stronger Than Desire. The film was written for the screen by David Hertz and William Ludwig. In its first half, Stronger Than Desire is a deceptively simple film. The audience is presented with a tale of an unhappy marriage between two very compatible people, whose problems could be solved if they would simply spend more time together. …until *SPOILER ALERT* Elizabeth kills Michael in order to avoid being blackmailed by him. He says his wife will divorce him and name Elizabeth in the case, ruining her reputation and potentially her marriage. In a fit of anger and worry, she shoots him. *END SPOILER* At just about the half-way point, the film takes this much more dramatic turn and goes from mildly interesting to quite engrossing. Virginia Bruce gives a great performance in the second half of this film, quite anxious. It’s clear that she’s having a great inner struggle and dealing with a lot of guilt over how things have turned out, and doesn’t quite know what she should do, torn between the truth and self-preservation. A great sense of suspense is built during the second half of the film as well. The viewer waits in anticipation for Mr. Flagg to discover the truth, and the wait is very tense. The reveal is inevitable; it was nearly unheard of, in the golden era, for a crime in film to go unpunished. All of the viewer’s and Mr. Flagg’s questions are answered in the end, with a great little twist.